Picasso once said all men are born artists. The problem is, they grow up. In a popular 2006 TED Talk, educator Ken Robinson wowed audiences with the notion that schools stifle creativity. He said a career in the arts is considered so beyond the reach of the masses that even promising artists are encouraged to look for more practical paths. But what if a budding artist were truly encouraged from a young age? Meet Aaron Axelrod, an L.A.-based artist whose 29 years look like an experiment for Picasso’s and Robinson’s theories. Thanks to his parents, both educators, Axelrod got the chance to develop early on, leading to a body of multimedia work that has evolved from photorealism to experimental video to sculpture, installations and live performances. “Everything I am today is because I had parents who realized what I loved and what I enjoyed, instead of being, like, oh, my son is an artist, eww, get those crayons away from him — take these math books, son, and be an accountant,” Axelrod explains at his Hollywood studio, which doubles as his home. Wearing glasses for his astigmatism, he has dried paint on his fingers, which flail wildly as he speaks, his voice going up and down like a roller coaster as he describes his process. In his four years in this studio, Axelrod has made more than 100 pieces, changing styles the way fashionistas change clothes. The dried paint residue on the floor has a story to tell. Plexiglas on a living room wall doubles as his painting wall. Different creations are scattered throughout the studio: 12-foot-long pastel paintings of scrambled news channels depicting staticky politicians; pieces of sculpture made from everyday items for projects he can’t even talk about for legal reasons. His MacBook is full of eye-candy photography with stunning models posing with water guns, boom boxes and 40-ounce bottles. In his kitchen are dozens of 40s, souvenirs from each girl he’s shot. Chances are you’ve seen his touch and not even known it. Band artwork at Coachella for Radiohead, Madonna and Ghostface Killah; set design for The Tonight Show With Jay Leno; murals at the headquarters of TOMS, Google and Disney; a building takeover for gangsta rapper Game’s deejay, DJ Skee, at his Hollywood office, complete with sculptures of vandals hanging off the building; even guest DJing for KCRW. Axelrod is most excited about his melting-rainbows project at the Vortex Dome in downtown. What started as a short, experimental film is now a performance piece incorporating lights, trippy sounds, music and Axelrod melting paints over an exercise ball–sized orb and projecting those images onto the crowd, the walls and the ceiling. The show, which last ran in late November, simulates a very visual trip inspired by Axelrod’s experience with the spiritual psychedelic ayahuasca. When Axelrod performs, he wears rabbit ears on his head, which makes him look like a mix of deadmau5 and the demon bunny from Donnie Darko. 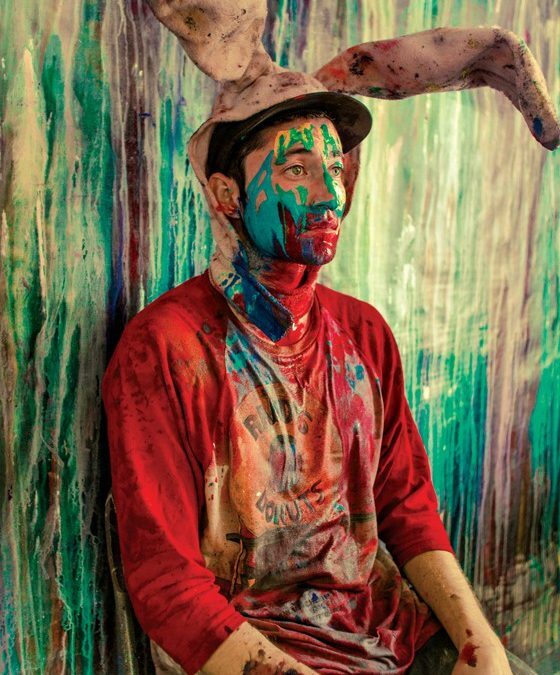 He says he chose the imagery to pay homage to the bunny in Alice in Wonderland, taking the audience on a wild journey. He feeds off the crowd’s energy and the bumping music, using his whole body to rub paint against the orb — arms, face, shoulders, mixing colors and designs without a defined plan, going with what feels right. He has had only a handful of live shows but sees this arena as his next step, exposing him to a bigger audience; he has more performances planned. How did Axelrod garner so much success so quickly, when so many others never make it past middle-school art class? It’s a mix of right place/right time, talent, personality and pure hustle. At 18, he was the youngest artist to make one of the Angels in L.A. sculptures, a series of decorated angel figures scattered around the city in the early 2000s. His first solo show was during his freshman year at CalArts, where he displayed more than 40 paintings at Art Share L.A. in downtown. But it was in high school when Axelrod really found himself. Since his mom worked as a teacher in Beverly Hills, Axelrod mainly attended the public schools there instead of near his home in Sherman Oaks. But he never made it past his junior year at Beverly Hills High, as he was kicked out for those class-clown tendencies, an event he says changed his life for the better. Axelrod described it as a gang school. Yet exposed to a new world, he blossomed. “I thank God I went to Beverly Hills schools because that’s where I got my education. Then I went to LAUSD, the real stuff,” he says. “No one in my class knew how to read. But the thing is, I loved it there, socially. I had so many friends. They were all just real people. They weren’t just into the newest Mercedes, or whatever the biggest pager was back then. Ditching class and hanging out with gangsters and crack dealers gave him a new entryway into his own creativity, Axelrod says. He wanted to incorporate an Everyman sensibility into his art.